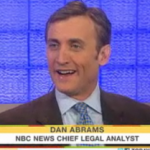 On Mediaite: Dan Abrams stopped by the Today Show this Sunday to comment on Amanda Knox’s upcoming trial. Knox was convicted in Italy of killing her roommate, Meredith Kercher, but is appealing the verdict now. Abrams offered some idea of what to expect during the appeal. To watch the clip, click here.